Strangford Sailing Club moorings are located in Audley’s Roads at the north end of Castleward Bay. The club does not have any designated visitor moorings but visitors are always welcome to pick up any suitable vacant mooring for a short stay at their own risk. The bay provides good holding ground with a sand/mud bottom for anchoring. The moorings are well sheltered except from a southerly wind. Visitors are requested to moor south of the club starting area which is a transit between Audley’s Quay and Church Point. NB – If you do pick up a mooring and are leaving your boat with no one on-board, please be considerate and leave a visible note so that the owner of the mooring can contact you on their return. SSC or its members will not be liable for the condition of any mooring in Audley’s Roads. Visitors who use them do so totally at their own risk. Visitors are welcome to use showers when clubhouse is open or by prior arrangement with the Hon Sec. At low tide the quay and slip have to be accessed by dingy. 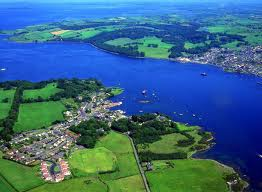 Full amenities can be acquired at the Portaferry Marina or Strangford Harbour. For information please contact the Honorary Secretary via e-mail secretary@strangfordsailingclub.com.